This article is part of a short (and sweet) wedding series. To start from the beginning, read Part One: How to get married for $239. Last day I covered our wedding costs for the flowers, invitations, venue, guests and of course my second-hand wedding dress. 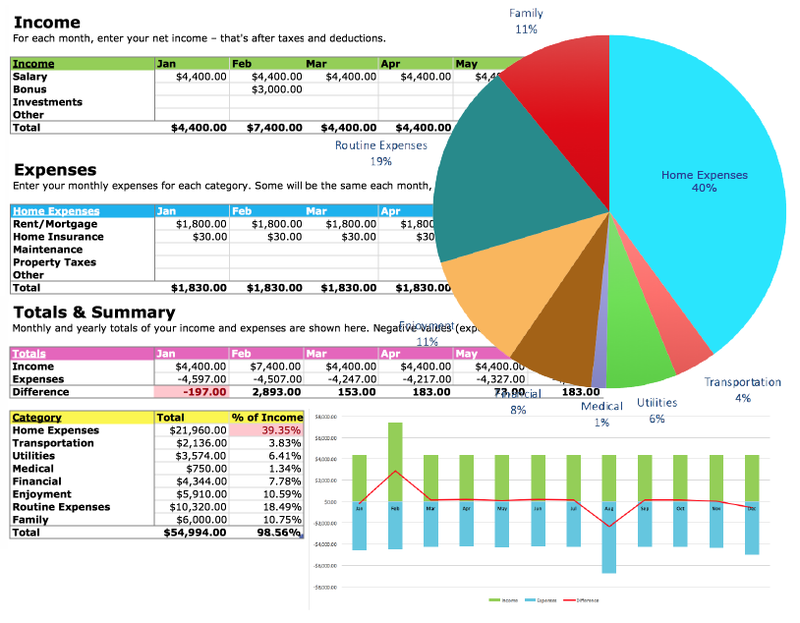 Find out our total costs and final wedding tab right here. Flour, sugar, eggs, and icing are cheap to buy. But as soon as you mix the lot together and call it a ‘Wedding Cake’ you’re on the hook for hundreds of bucks. I priced a few wedding cakes only to be shocked that bakeries charge a staggering $5, $15, and more per slice! Depending on your caterer or venue, you may have to pay a cutting fee to serve the dessert too. Personally, I’m not a wedding cake person. I’ve never dreamed of sugary tiers of frosting with marzipan topping my wedding day. No, never, nope. 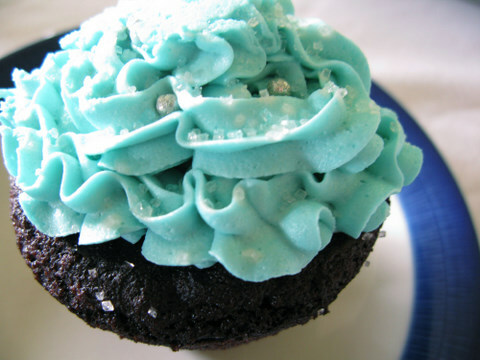 Big tasty chocolate cupcakes topped with teal icing. Now that’s fun. I ordered the gluten-free variety since I can’t eat wheat, so even these mini cakes were a tad bit on the expensive side. Bottom Line: Cut the costly wedding cake and choose another dessert option to save huge marital money. Mini cakes, dessert bars, fruit, and other treats can be purchased (or made) for hundreds less. The amazing Kate (that’s my sister-in-law) put together the delicious menu and brought a few homemade salads and side dishes. We had a lot of leftovers, for days. Bottom Line: Opt for a tasty lunch over a hearty dinner to save big wedding dollars. Getting the whole family to pitch in for a potluck meal could save you hundreds (perhaps thousands) on food and liquor alone. 8. Your friends, the photographers. So I asked my friends to earn their dinners. Reread this cost-cutting request from my Facebook wedding invitation. Everyone MUST bring a camera though. We don’t have a photographer. I’d take photos but I’ll probably be busy, getting married or something. My friends took amazing photos. I’m beyond thrilled. Bottom Line: Lend out your camera gear and ask everyone to snap a few photos. They won’t be professional quality, but you’ll see yourself through the eyes of your family and friends. 9. Don’t get odd over the loose ends. The odds and ends happen to everyone. 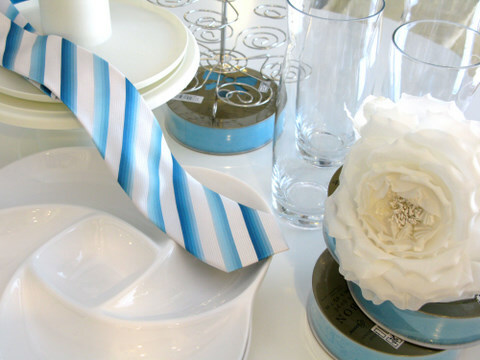 Hair, makeup, vases, ribbon, gratuities, and tax all cost money, but don’t always fit into a tidy budget category since these purchases can appear sporadically. Do yourself a favour and keep all your receipts. Music: $0 — Guests brought personal playlists on their iPods. Hair and Makeup: $0 — I did this myself. Bottom Line: Arrange your own flowers in dollar store vases, apply your own makeup, do your own hair, and ask your friends to create special music playlists to really keep your wedding day on budget. 10. Setup and Take Down. Setting tables, arranging flowers, and packing the party up yourself could save you big moolah too. 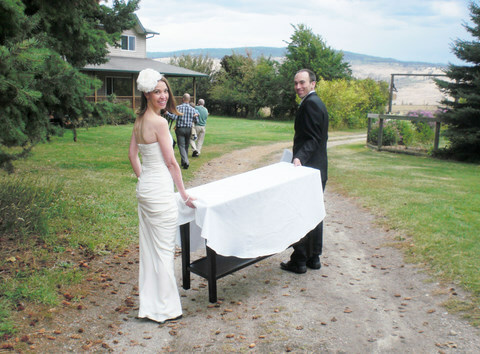 My friend Derek thought it was funny when the bride (that’s me) and groom (that’s Carl) hauled tables around the ranch. Our guests carried their chairs back into the kitchen too. This is how it’s done on the farm, people. Bottom Line: Do the work yourself and bank those precious bucks. 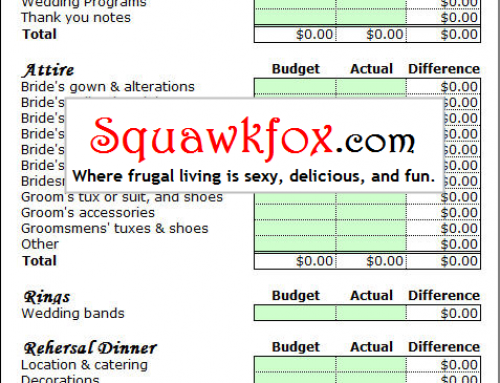 Tip: Download my Free Wedding Budget Planner Spreadsheet to keep a close eye on your wedding costs. Here’s another idea for a cake: we went to a local business that sells ice cream cakes, got three round white cakes in different sizes, and stacked them on a nice plate. The result was a three-tier white cake. We had about 100 guests on a hot summer day and everyone had as much ice cream cake as they wanted. There was a small amount left over. Cost of a three-tier wedding cake: $60. I just realized that you have basically held a themed party. And I’m guessing everyone had an awesome time! I really like a lot of these ideas so I forwarded the post to my newly engaged sister. I do think a potluck lunch for a wedding is a little tacky though. Come celebrate! Bring a gift! Oh yeah, and also pay for our food and photography. Classy. re Natalie’s comment about “Classy”. Everyone joining in bringing food and taking photos lets everyone truly participate. I bet a lot of people really enjoyed themselves. Also how classy are wedding registrations stipulating what you hope to receive? How classy is asking for cash for wedding presents so your guests can pay for some fancy-schmancy honeymoon? Especially when you both work and have been living together for three years. Really, what can you need? I do think it is tacky to ask for cash as a wedding present but that doesn’t make telling guests that they must pay for food and provide free photography in order to gain the honor of supporting you on your wedding day classy either. If the couple both works and has been living together for years, doesn’t that make it even worse that they make their guests pay to attend their wedding? @Natalie – Actually, in a traditional wedding the gift you bring does often represent ‘paying your way’ to the event. Not to mention hotel costs, etc. Friends support friends, that’s the whole point of friendship. @Kerry – Loved this article! My husband and I had a lovely small wedding – 23 guests, we asked for no gifts, a friend played guitar for the ceremony, we had pie instead of wedding cake, and after dinner I traded the wedding dress for something more subdued and we all went out for drinks at a local pub instead of doing the DJ and dance thing. 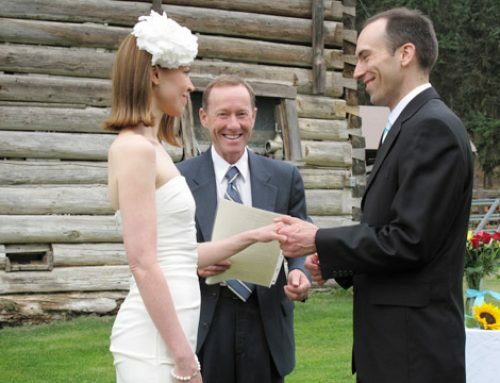 It really was our wedding – from style to substance – and I wouldn’t have done it any other way. I find it fascinating that you’re getting negative feedback from these postings (presumably via e-mail as I’m not seeing much negative in the comments). As with many things in our modern world, albeit more extreme, the wedding industry is out of control. A big party for your friends costing a few hundred bucks – sounds perfect. Even the big party my friends had in Cancun where it cost me a couple of K for flight and 10 days of all-inclusive wedding party partying/vacationing wasn’t bad. But (tens of) thousands of dollars on a “traditional” wedding? I’ve endured those for years and it’s boring for the guests, stressful for the active participants and a win only for the dress/cake/venue people. I think your low-key, low cost, (actual) friends & family wedding was awesome. I really enjoyed these posts! I find the older I get, the less I want to spend on these things when I finally tie the knot. Your wedding is my new dream wedding — laid back, budget-friendly and a really good time with people I care about. Married 40 years ago in Ontario (and still married) – $10 for the license, $15 for the judge. Guests were our two sets of parents plus my two brothers. My mother made a banana cake (my favourite), my father brought champagne and wineglasses. Photos were taken by my father and brothers. After cake and champagne at our apartment, we all went out for dinner at a Chinese restaurant (my dad paid so I don’t know what it cost), then visited my grandmother who was unable to be at the ceremony due to a sprained ankle. It was a great day and I’ve never regretted doing things on a small scale, even though we could have afforded something fancier. LOL, I can just see Karel’s face if I tell him that we can only have four guests! But I love the ideas and I also think it’s absolutely right–you don’t need a lot to get married (although I will probably spend a good €200 in white silk and lace to make my dress, but then it will *really* be a designer piece, hehe). I could never understand how people get themselves so worked up over things like flower placement and cake design. Speaking of which–if you’ve ever made your own cake icing, I promise, you will never ever touch another cupcake again. Or at least, you will think twice…there really isn’t anything fancy about buttercream, but the sheer quantity of sugar and fat it takes to make it is mind-numbing…not to mention gut-churning…and vomit-inducing…. P.S. Forgot to mention that I wore a white dress I already had and the groom came in jacket, tie, etc. that he already had. @Nathalie – I think you need to re-read the article as guests were specifically asked not to bring gifts. Considering I usually spend at the very least an hour to go out and find a gift, I wouldn’t mind spending spending an hour puting some love into a homemade dish rather than something without thought on a gift registry. This is super helpful! Thanks Kerry. All in all, I do think there are a lot of good ideas in this article. @ Natalie and everybody else with the tacky-factor: I’m not sure what you’re complaining about, because none of the guests did. If there were 100 people there, I’m sure Fox and Karl would have done things differently, but these are *CLOSE* friends and family. People whom you regularly send home with your baking dish and whose casserole dish you have in your cupboard, whose kids you watch on short notice, who help themselves to the cookie jar without having to ask (OK, maybe that’s just our close friend). Elegan and elaborate may very well be your thing, but it’s not necessarily what everybody else wants. Fun, funky, and being able to relax without worrying about which fork goes with what course sounds like a perfectly good time to me. And come on…who hasn’t looked through a pile of wedding photos and thought, “I coulda done better”? Well, what better chance…? Lovely ideas. I do wonder if you have relatives who would love to have been included. Also, we don’t all have parents with ranches. Some of us have parents in cramped apartments. I love the story of your wedding because it was so creative and so YOU. I would have made very different choices, but I would much rather attend a scaled-down wedding that reflects the bride and groom than a traditional wedding with all the expected bells and whistles. Kate did her own make-up (the Duchess of Cambridge) and she set a trend for brides everywhere. Kerry, this is fantastic (the blog post and the event). The bottom line is that everyone needs to celebrate their special day in the appropriate way for them. I bet your friends and family were ecstatic and no one should be telling you otherwise (I don’t understand why @Natalie is so upset – it’s not her wedding and did I miss the part where you told people to pay for coming?). I’ve seen all sorts of weddings and the ones that are true to the couple (whether is fancy schmancy pomp and circumstance or backyard potluck) are the best. The ones where the couple was coerced into having more guests, more frills, etc. than they wanted (even if someone else was paying) were not as natural. You looked beautiful (Fluevogs! Love!) and it sounds like there are no complaints (and no debt). I’d say 100% success. @ Kerry & Carl, Blessings, Congrats, Happiness, Health, Prosperity! With the hindsight of 54 years and 10 years with my woman and best friend (yeah, I’m “owned”), I’m appalled by the wonton, indulgent one-day spending sprees that too many of my petulant friends & family have foisted on my savings account. I scrimp & save all year for 5 minutes facetime with a frantic bride & groom?! Vacation time, gift, 2 airfares, hotel, rental car; it’s cheaper to just buy them a new 60″ widescreen and mortgage payment (not likely)! Every couple should be saving every penny & dime for the trials & tribulations that WILL come. Hence, the need for our frugal “SquawkFox”. Just another laid-off shipcarpenter in Miami. Loved the low key wedding ideas you wrote about, Kerry. And congratulations on your recent nuptuals. Wedding costs have gone way-over-the-top-crazy and couples feel like they are mandated to buy into the hype. Just boggles my mind how couples spend $40K on one day and a decade paying it off — in some cases longer than the marriage lasts. The most important part of a wedding day is the couple. Everything else is a distraction. My husband and I eloped. Mom wasn’t happy, but we used the $$$ we saved for the down payment on our house. It was nice: A quiet ceremony and a nice dinner with our two best friends/witnesses. Absolutly love it! This is what a wedding is supposed to be. Two peope getting married with the people close to them in attendance. I don’t think any of this is tacky. In fact, if I were a guest, as an avid baker I would have offered to make the cupcakes for Kerry and Carl – no problem at all. If not the cupcakes, any dish would have been my pleasure to bring to their special day. As for taking pictures, people typically bring cameras and take pictures anyway…no big deal to take some more and forward off the digital copies. We got married 8 years ago. We had a church wedding for 250 people. It was opulent. But instead of costing $50K, it cost $5K. We got help from our friends. We bought what we needed. Counting the food, wine, beer, wedding rings, musicians, clothes, and a certificate done in calligraphy big enough for all the guests to sign, it was around $5000. Way more than this wedding. In Ontario, you need to pay extra for alcohol you consume in a public place AND you need a license. We bought lots and returned most of it. It turns out our friends don’t drink much. Also, a friend who is a part time DJ made a lot of CDs for the party afterwards. But friends in the church played music, made food, served hors d’ouvres, took pictures and videos, and MC’d. They felt like they married us off, and they were right. If you can make the event a community celebration and avoid the princess for a day culture, you can have a wonderful time and still pay for your own housing and education. If you don’t need to feed 250 way too much, you can do it for lots less. And your friends will love it. I just wanted to say congratulations on your marriage! I wish you and your husband many, many more years of happiness and wedded bliss! Herlizchen Glückwunsche! Forgot to add: beautiful wedding pictures and you are a beautiful bride, Kerry! I wore my mother’s wedding gown and only paid a small dry cleaning fee. Our church let us use their facilities for free, even the large downstairs room for the reception. Our pastor gave us the check for his fee back to us as his wedding gift. A friend made our gorgeous wedding cake for a pittance. We ditched the DJ because we can’t stand them. I did go overboard on flowers, but it was November and hard to find seasonal ones. And digital wasn’t around in 1984 so we had our invitations printed, but we saved on sending them to local friends at our church by sending one invitation to the entire church. Our refreshments after the evening wedding was just the cake punch, quick breads, and cheese, crackers, and summer sausage. Much of that was donated. The rest didn’t cost much, and certainly not what an entire meal would require. And no one needed a full meal after a 7 PM wedding. Also, our church family volunteered to house any of our out-of-town guests at no cost. Congratulations and well done Kerry and Carl. What most of us these days refer to as a “traditional wedding”, isn’t really. Weddings with all that pomp and circumstance were the venue of royalty; and was an overt expression of wealth and power, perpetuated to awe the masses in a time when kings were sometimes believed to be descendants of God(s). At least, that’s how I see it. So – if your real need is to impress everyone go ahead and I will have my little chuckle. I think you have to set your own boundaries and, no matter who plays hurt or snubbed, be very firm about them. Sadly, some couples have weddings that someone else wants, not them. And those who put on the pressure — lay off. I think weddings are about love and joy in life; about sharing and celebration of souls. These are the most precious things in life; they are also the most simple. All awesome ideas and a lovely wedding! my husband and I bought our wedding cake at costco and decorated it ourselves for $20. Basically it was used for pictures because desserts were included in our venues buffett and we joked about returning it as costco returns everything. Hi Kerry. I read both articles and was inspired. I’m not married, however, my dream wedding would include a BBQ and a swim at the beach. I commend you both for your practicality and willingness to go against modern trends. With regard to the potluck, there are few things that say “I love you” more than food made with love by those who love you. Got married 10 years ago and spent 15 000 including honeymoon. Had parents that contributed on both sides so we only paid about 4000 out of pocket. And our honeymoon was paid for in cash gifts.I look back at the “memories” and to be honest I can’t remember much! I’m glad we didn’t go in debt, and I’m thankful we had family who contributed without us even asking. That being said because they were contributing there were hard feelings later because we didn’t invite all of “their” friend couples. Also had a family member call me up and insist on getting two extra people invited and then they “made up for it” by giving us a riduculously high cash gift. These are the things I remember which is not what a wedding is about. I think we could have used the money in a different and better way. We also splurged and had a terrible honeymoon because we thought the tourist resort in a “hot” country was what you were supposed to do. Wished I’d had more brains and gone camping or drove across Canada or something. Also wish I hadn’t gone to those stupid bridal shows because they always make you feel like you’re cheap if you don’t spend. Also regret my choice of bridesmaids as I don’t have contact with them anymore, chose them out of guilt feelings. I could go on and on. Congrats Kerry on thinking for yourself and being yourself. The most important part of your day was declaring your love between you and your groom. Definitely will reinforce this with my 3 kids when it comes time. Thanks for sharing the story of your wedding. I love that you and your husband did it your way and didn’t allow yourselves to get sucked into doing certain things because other people thought you should. I recently attended a wedding with a potluck reception, and I thought it was fun. I love to cook and never mind bringing food when I’m invited to someone’s event. Why should a wedding reception be any different from any other event? AWESOME wedding! I TOTALLY love the small home-themed party. I always remember the Mary Tyler Moore episode of Ted and Georgette’s “come-as-you-are” wedding (john ritter officated in tennis white’s) and that has always stuck in my head as a fun way to do it! It’s certainly “unique” from most weddings done these days, huh? Best wishes to you and congrats to Carl! Wonderful that you designed the wedding to suit yourselves. Thanks so much for your article. Of the weddings I have attended, my favorites have been small intimate affairs. When I was remarried in 1997 our wedding was at the church I belonged to similar to another persons story. I had been on the Board of Trustees so we were gifted the use of the facility and the Ministers donated their time. We were blending families so our children participated in the wedding and the reception. We had a potluck also, no one was turned away if they couldn’t bring a dish and everyone was happy to share food. The groom and I spent money on my clothes(I had a dress made), the beverages, flowers, a wedding cake and any incidentals. A good friend took pictures for us. I know our cost was between $500-1000. It was mostly family, good friends and co-workers so it was like a party and that was the mood for the reception. We also asked for no gifts, though some people brought them anyway. What I think a wedding really comes down to is what celebrates you, your relationship and the love you share, so kudos to you on having your wedding exactly the way you want it! I think someone else already said it, but this is my new dream wedding. 🙂 My boyfriend and I are not in the stage where we’re ready to take the next step, but I know that this is exactly how we would do it. I have girlfriends that would probably try to talk me out of it, but every time I picture what our day would look like – this is exactly what comes to mind. Thanks for sharing! What a beautiful day 🙂 All the best! Got married 18 years ago (has it really been that long??) for under $2,000. 23 guests. My mom made my wedding dress…$100, and I’ll *never* part with it. Big splurge was photos — we went to a studio for pictures, as my sister’s wedding with u-do-it style photos bombed — and gave each guest one. Other big expense — we did the dinner at a hotel instead of something cheaper. I just got married and did the same thing (frugal all the way). The star of the day was the wedding dress that I hand-knit. That dress (costing me approximately $50 in yarn) will be long remembered. I think too many people go into WAY too much debt, throwing a wedding where they end up doing what everyone else wants. As one poster said above, she hardly remembers the wedding they spent a fortune on. I don’t think a potluck is tacky at all. When you think about it, isn’t that exactly what farm families did in the old days? I would like nothing more than to have a simple, small wedding, but since my boyfriend comes from a showy family, his parents will want to invite every one they know and have a grand affair. This is making eloping sound more interesting. @Megan. 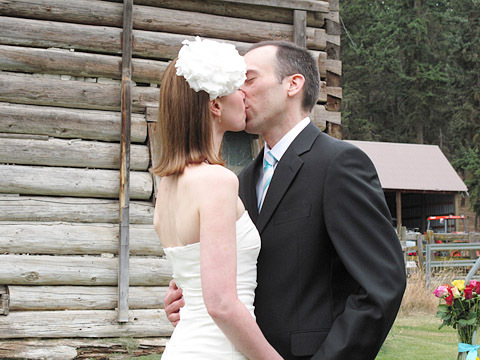 Eloping is actually awesome as well as frugal. Here in South Africa, my husband and I eloped. It cost us a grand total of $6.80 for our marriage license/certificate from our local Home Affairs/government department. We then simply spent 2 nights together at a local bed and breakfast establishment afterwards. So we were actually able to cut the total cost of our wedding right down to $56.80. Love this post. We married 12 years back on 5 days notice. Saved money by phoning the 42 guests, booked a venue on a Sunday morning for a vegetarian eggs benedict brunch and rented two options for retro dresses (not white) at a local costume shop (kept one at a cost of $75, plus an alteration of $40). Had a photographer as well as disposable cameras for guests to take shots. Bought a photo album (small) for guests to sign for about $20. Bought a cake, decorated, for only $80. Forgot to use the bouquet I bought… All in costs around $750. (parents paid the photo purchase) All enjoyed, and many lovely memories of people close to us. There seems to be a thought out there that the larger the wedding, the more likely the marriage will survive. My husband and I married during reading week from university with a guest list of 20 – we will celebrate our 30th anniversary next month. The majority of our friends are either divorced or on second marriages. I enjoyed adding special little touches to the day but was relieved not to have to plan a huge event. The best part of the day? Looking into his eyes while reciting our vows. Priceless. I LOVE IT! When my hubby and I tied the knot in 2007, our venue was on the beach in the town I grew up in. My bouquet was my favourite flowers, black-eyed susans (freshly picked that morning)and our family threw us a BBQ at a friends house after. We invited only family (bring your own chair) and seriously, only got married for the cost of the marriage license, commissioner, and gas to get there :)I did my own hair and makeup, and wore a dress I loved that I already owned. No shoes, since it was a beach. I have never desired a wedding cake, so there was none. But we have lots of wonderful memories with wonderful people and lots of pictures from our camera we passed around. Thanks for sharing this! Almost exactly what we did over twenty years ago, except close family came from the coast. Along with a salmon for the BBQ. And milk did come in bags in BC about the same time. Best Wishes of everything for your growing family. Love your posts, pictures, philosophy. Don’t let the nay-sayers get you down. I could see how the pot luck idea could be considered tacky by some but i think that in certain social groups its fine. you know yourself and so do those close to you, ie. the ones you would invite to your wedding, so you have to be true to yourself. if your a catered type of person great if not thats fine too. i think your wedding you should do what makes you happy. In regards to the comment about “Come Celebrate, Bring a gift. and by the way bring a food;” Natalie what part of “NO GIFTS” did you not understand! Great ideas Kerry! 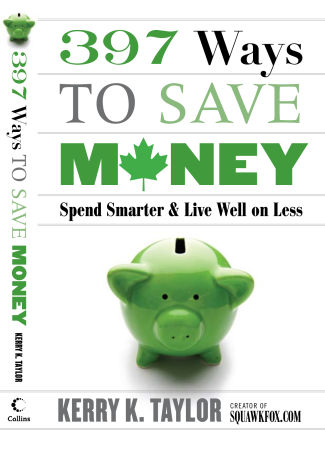 Love your frugal ideas! Amazing post. I’ve been to a few weddings and it was all pomp…for me, I hope to find a lady like you who is all about keeping it minimal and low-budget! I’m not into the showy stuff and your wedding looked awesome! That wasn’t just a wedding, it was a celebration! How completely wonderful and rememberable . a great time…..NOW THAT WAS A WEDDING! What a way to “do it”. Still as many memories and warm fuzzies. A shame we feel that we have to put on a grande show to impress – who? Congrats! And I love your writing style! Congratulations on a memorable wedding! I am so glad I found this site. I am 70 and have already done most everything you have written about. It’s so nice to find a kindred spirit. I feel as if I am reading about myself as a young adult. Even had a November (1970) wedding. Made my own dress and a Dior bow for my hair from left-over fabric – $10 for fabric. Bought new white fabric shoes. After the wedding I had a shoemaker dye them black and I then had new dress shoes. Our reception was held in the ballroom of a veterans’ club to which my husband belonged, so no cost to us. We have large families on both sides and most of our friends are family members! When they found out we were getting married, they immediately planned a pot luck dinner. We enjoyed a dinner of all family favorites. Hubby’s sister made a wedding cake for us. Unbeknownst to us, my cousins got together and planned and made the decorations for the reception room. After the ceremony, we stopped at the photographer’s and had two photos taken – one of just us and one with our 2 attendants. We didn’t ask the family to do anything, but besides the dinner, they eventually inundated with photos from the ceremony and the reception. What a grand time and happy memories for all! May you, too, have as many happy years together. We cut cost on our wedding cake too by getting a wheat free cake (most of family can’t eat wheat) by having a gluten free baker at the local farmer’s market bake it for half the cost of a regular wedding cake. $350 compared to $800-$900 for a gluten free bakery to make it. We also saved on our transportation as it was a wedding gift from family freinds and our photographer was my cousin so she did it for free again as a gift. I think the perfect day for a wedding is one where costs are cut and your not in debt just to marry the person you love. So glad I found this post. If anyone else has awesome ideas, I’m open to them! I LOVE THIS! We got married in 2011 as well (actually on September 23..Weird!). We opted for a small luncheon style wedding. It was immediate family only and a few friends. I have a big family, so I only had the ones closest too me that I actually saw on a regular basis. Lots of people were offended, some still mad but it was what we wanted! We also had a house party that night for our close friends to attend. Everyone brought their own booze and an appetizer and it was a great night! People go way too over board for one day. I spent money on things that were important to me (like hiring a professional photographer for family photos) but saved in other areas. After all when its said and done its more about the marriage and less about the wedding. I also wanted to mention that your wedding day sounded like it was a beautiful day, filled with love and was intimate and personal – which in my opinion, is what a wedding day should be. For Nathalie to say it is “tacky” to have a pot-luck and ask your guests to take pictures is funny, because well you know, inviting your guests to a fancy banquet hall with gaudy chandeliers, three-course meals, open bar, and loud DJ music and expect for your guests to buy you a gift on your registry or in many cases where I am from (Toronto, ON) the rule of thumb is to pay for your plate, which equals anywhere from $100 to $200 per person is not at all tacky. Now, I am not saying that banquet weddings are tacky, but I am arguing how bringing your own camera (which everyone owns one – including your smartphone) and bringing a (dish homemade or bought) is tacky? Are you suppose to go to any event empty-handed? Nah, I did not think so. Hello. I camd across this article from a friend, and loved it! I’ve been married 5yrs and had a very small wedding as well. We did a potluck lunch as well. All guests made their favorite dish, and attached the recipe so we could start out very own cookbook. The guests really enjoyed it. My photographers were free because I have a brother and my my husbands cousin that are photographers. My wedding cake was free, hair and makeup free, my husband made my bouquet and those for the bridesmaids from Walmart flowers, I created the wedding playlist, and so much more money saving things. We spent the most on my dress, his tux, and the venue. I was very proud of my “tacky” potluck wedding. Again, I like the idea of having guests bring a dish or two to help compensate for the food and not bringing any gifts (unless you need some stuff and don’t have the money to buy it yourself, of course). The wedding photographer, again, I would spend some money to have some nice photographs to pass down to my kids. It all depends on what you can and are willing to spend for a “nice” – not glamourous – wedding day. Something just nice enough for a celebration of your wedding, and have memories to cherish in the future and not go into debt. From a financially realistic point-of-view, I honestly would spend no more than $200 on any wedding (minus the dress), if I ever do get married. Hello “squakfox”! I’ve been an avid “squawker” for about 3 years now and I’d like to thank you for all your help! I use your methods almost on the daily, and now I finally am doing it for my informal wedding. We will be spending a bit more for our formal engagement and formal wedding, but because of some legal reasons…we’re getting married just one month after we decided to get hitched! Sounds crazy, but I would like to give my two cents to brides who worry about getting everything on time. Easter Sunday we started looking at licenses and commissioners, found where it was the cheapest and fastest (apparently across the street from us!) and since we only need one witness, we decided we’d only invite one person and allow one guest (since we’re getting married for legal reasons at the moment, and will be “getting engaged” for family in 4 or 5 more years). We live in a studio apartment, so we can’t really do it in our backyard, however I decided that we’re going to try to Barbeque on the beach or a nearby park. Reservations for those places are free, so all we’d have to pay for is chicken, beverages for 4 people, mix for caesar salad, and stuff for “scampi” styled veggies…Oh and gas. Total estimated cost: $33! Our rings we got on sale and we decided to go for the cheaper materials: sterling silver and cubic zerconium for my ring instead of real silver or white gold and real diamonds, tungsten for his band instead of real silver or titanium…Both look real! No one knows. Cost for both: $90! But we wasted a little gas to find them…so add about $20. We already have a tie for him, skipped the fancy shoes, vest and jacket, so for slacks and a button-up we estimate for him $50. Oh! We are going to do the guest photography thing, and it doesn’t hurt to have our friends in the hospitality business! Because, Bonus! We got our honeymoon comped by our guests too! 😉 3 days at the Aqua Casino in sunny Palm Springs, California. My family lives there and so do a lot of my friends, so it will be mostly free to vacation when we decide to go. Only $30 in gas to get there and back. And that’s shooting a bit over. We expect to only spend $350, but are trying to shoot for $300. That’s how to have a total wedding for under $400! I found your blog when I googled DIY kite instructions, but your posts about a frugal wedding really brings back memories of my (and the Mr’s) wedding 10 years ago. We are also in BC, also hired the marriage commissioner and also had a free venue (the beach! We got married at Spanish Banks) and had a potluck brunch later – we asked guests to bring something to the potluck in lieu of gifts. Also did our own flowers, and instead of the big white cake a couple of friends baked pies and chocolate cake. It was fun, low-key, and one of the the kids there said it was the best wedding she’d ever gone to, and I agree.